Lauren Holloway: The mother of twin daughters, this cashmere-and-pearls housewife has always been careful to do the “right” things in life. Erin Karmeli: Clad in tight jeans and low-cut tops, she’s a vodka-swilling, straight-shooting single mother who openly admits to making all the “wrong” choices. For Her Better Half, I did something a little different than I usually do. I have six Reader Discussion Questions available for you to download in PDF form and use in your book clubs. 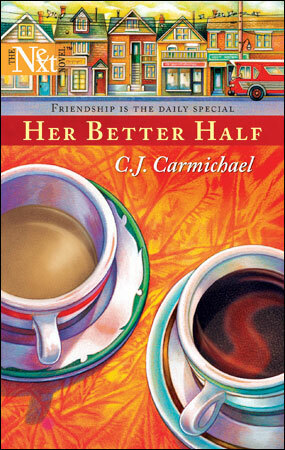 The title of the book, Her Better Half, can be interpreted on many levels. Discuss it’s meaning in relation to Lauren’s marriage, her self-image, and even the house she moves into on Carbon Corner. In some ways what happens to Erin affects Lauren more deeply than her own divorce. Why is this? What does this say about the state of Lauren’s relationship with Gary? Download the full version in PDF form and get your discussion started! On the day my husband left me, we were in the middle of a wicked heat wave in Toronto. Inside the bedroom of our estate home air conditioning masked the high temperatures and humidity. I actually felt cool as I watched Gary stuff a select few of his belongings into a backpack. I noticed that his pants were loose around his waist. He'd dropped a few pounds since he'd adopted the vegetarian diet. That had been six months ago. It had not been my first clue that my life was going to take a dramatic and unexpected turn. There'd actually been many, but I hadn't seen them at first. Or maybe I'd seen them but just refused to accept them for what they were: evidence that my husband was growing apart from me. "I still think we ought to try counseling." I was proud of how calm I sounded. I would not be one of those shrieking women who went crazy and broke things and swore they'd kill him, or herself, if he didn't stay. "Counseling won't change anything. This has been a long time coming." Too bad no one had told me. But maybe I was letting myself off the hook too easily. I'd been the one to sign Gary up for the mediation course last winter. I'd seen his simmering anger, his mounting stress. He'd been a man at the breaking point. Until he found yoga. Or was it the yoga instructor? I still wasn't sure. "Losing my job was the best thing that could have happened to me." He went to his sock drawer and picked through it, leaving all the fine, wool, dress socks behind. "It was a sign that I'm finally on the path to healing." Oh, for Pete's sake! I was so sick of hearing about the 'path of healing.' This path didn't feel anything like healing to me. It felt like betrayal, and hurt and abandonment. "Getting fired wasn't a sign, Gary." Who in their right mind considered losing a job a green light to desert your wife and children to go backpacking around the globe? "How would you know, Lauren? Not to be cruel, but you're not exactly in tune with your spiritual side." Despite the air conditioning, my internal temperature jumped up a few degrees. "Oh, really?" ...I couldn't stand the way he was talking to me. Like he was the intelligent, rational adult while I was the mental equivalent of a temperamental toddler. He was treating me and our marriage like an encumbrance to be eliminated in the same way as a bothersome outstanding balance on a mortgage. The question just came out. I hadn't planned to ask it. As I stood there waiting for his answer I found myself remembering the girls when they were little, scrambling out of the pool after a swimming lesson, wet and shivering, waiting for me to wrap them in a towel. Now I was the vulnerable one, waiting for Gary to throw me something. If not a towel, then maybe a facecloth.